The Lenovo A369i is an entry level smartphone of Lenovo brand. Bringing Filipinos a dual core smartphone at an affordable price, with that Lenovo logo on its phone. With the price of P4,499. Lenovo A369i is set to compete with similar phone with similar price in the local market. According to Lenovo's official Facebook Page, the Lenovo A369i is now available on key markets in Philippines, specifically on major cities and online stores. Note: No LED flash and front camera. 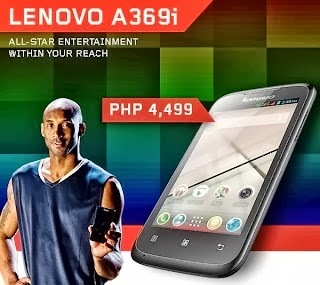 Again the Lenovo A369i is price at Php4,499 SRP. Available in the Philippines nationwide.